If you can charge a plug-in car at home or at work, consider the Ford C-Max Energi plug-in hybrid; its higher price will be partially offset by a federal income-tax credit. The 2018 Ford C-Max is past its sell-by date and will be discontinued after this year. 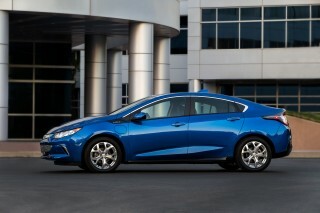 It's a tall hatchback available as hybrid or plug-in hybrid. 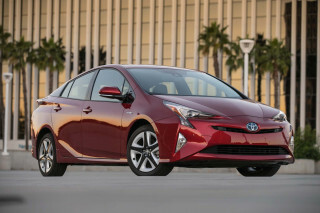 It launched in 2013 as the company’s response to the popular and fuel efficient Toyota Prius. The higher-volume C-max Hybrid suffered from a pair of reductions in its EPA fuel-economy rating, and has not sold particularly well as gasoline has remained cheap. Ford announced it would end production of the C-Max in 2018. It’s available in SE and Titanium trim levels. We rate the 2018 C-Max at 5.3 out of 10 possible points, reflecting its lack of active-safety features and increased competition from a variety of more recent hybrid and plug-in hybrid models. (Read more about how we rate cars.) 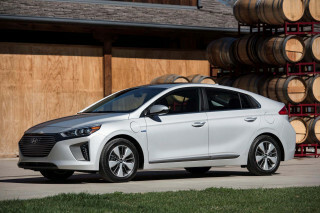 Those include the latest Prius and Prius Prime, the second-generation Chevrolet Volt, and several hybrid mid-size sedans, as well a growing variety of all-electric models with 200 miles or more of range. This is likely to be the last—or perhaps second to last—model year for the C-Max pair. 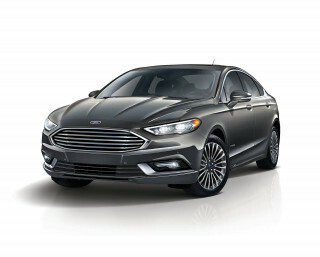 While the model will continue in Europe, Ford is expected to introduce a new vehicle in the U.S. for 2019 or 2020 that offers hybrid, plug-in hybrid, or battery-electric powertrains. That car, rumored to be named Model E, is likely to replace both C-Max versions and the low-volume Focus Electric model as well. The C-Max is essentially unchanged for 2018, following the addition of a standard rearview camera last year. Two new paint colors have been added. The 2018 Ford C-Max is a tall, somewhat awkward hatchback with an appealing interior that outshines even the newer Prius. Below the slightly bulbous hatchback shape of the 2018 Ford C-Max are the underpinnings of the Focus hatchback. 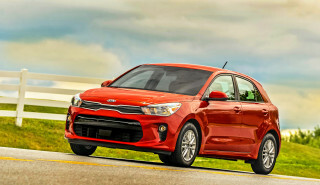 But it’s considerably taller than the conventional Focus, making it effectively a small minivan. That type of vehicle has sold well in Europe, where the C-Max originated, but has never been popular in the U.S., so the combination of short length and tall bodywork remains somewhat foreign in North America. The traditional Ford trapezoidal grille up front reinforces the brand identity on the C-Max; it received extremely minor tweaks last year, but remains bottom-heavy and awkward. The snub nose, the angles and accents of the body sides and window shapes, and a relatively vertical tailgate aren’t helped by relatively small wheels in large wheel arches accented with fender creases. The overall look varies depending on the angle; it’s somewhere among a more upright Focus, a tall wagon, and a tiny minivan. The interior remains appealing even after six years, with high-quality materials and a stylish dash with touches of brightwork. that feels more expensive than the compact segment it occupies. Soft-touch materials, appealing seat fabrics, and a more traditional and coherent set of instruments and controls add up to a more reassuring and premium impression than the odd central information display and unusual controls of the Prius. Ford lets owners configure the instrument screens to show the operating information they prefer. The 2018 Ford C-Max drives pleasantly, but it’s heavy and somewhat slow; numerous hybrid competitors have now surpassed its performance. Ford has updated its hybrid system only slightly over six years, meaning that the 2018 Ford C-Max has been surpassed in acceleration and fuel economy by numerous more modern vehicles. At 3,700 pounds for the hybrid and 200 more for the Energi, it’s a heavy vehicle to start with. 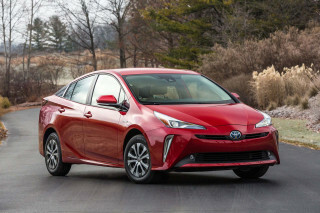 While it drove nicely against the 2013 Toyota Prius, the newer generation of that car and a host of recent hybrid sedans offer a better balance of acceleration, fuel economy, and nimbleness. We rate the 2018 C-Max at 4 points out of 10, deducting a point for its heavy road feel and slow acceleration. (Read more about how we rate cars.) Remarkably, the current Prius is now roughly on a par with the C-Max for driving quality, something almost unimaginable at its 2013 launch. The C-Max is powered by a 2.0-liter inline-4 and a two-motor hybrid system that produce 195 horsepower combined. 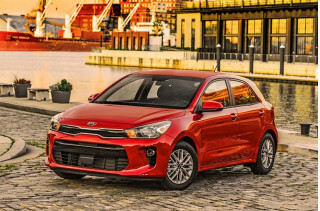 The tall hatchback is several hundred pounds heavier than the new Toyota Prius, rated at just 121 horsepower, but the added power is needed to move the weight around. The C-Max delivers decent acceleration off the line, but it’s no longer the standout it was and it slows down at higher speeds. 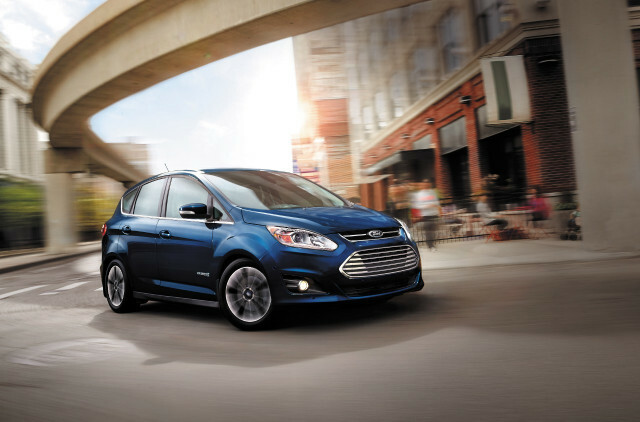 Like all hybrids, both C-Max versions can travel on electric power alone at lower speeds. The 1.4-kilowatt-hour lithium-ion battery of the conventional hybrid gives about a mile of electric range if you’re moderate in your driving. The larger 7.6-kwh battery of the C-Max Energi plug-in hybrid is EPA-rated at 20 miles of range, and it will accelerate all-electrically up to 62 mph. Still, its range is lower than the 25 miles of the Prius Prime, various plug-in hybrid sedans in the high 20s, and 53 miles for the latest Chevrolet Volt. Ford’s blending of regenerative and friction braking is first-rate, a hard trick to pull off and a mark of almost 15 years of building and selling hybrid vehicles. An “L” mode increases the degree of regenerative braking. When the gas engine starts, its power blends in seamlessly and noise suppression remains good. Driving quality is good behind the wheel, though it’s not the lithe, tight feel of the Focus hatchback. That car is fully 650 pounds lighter, and its responsiveness shows it. The C-Max isn’t particularly ponderous, but passengers will feel a firm ride with some road-surface flaws coming directly through the suspension. Its steering has good feel and makes the car precise and easy to place. The 2018 Ford C-Max is spacious inside, comfortable, and quiet, but its cargo space is compromised by the battery pack underneath. In Europe, a slightly longer version of the C-Max is a small three-row minivan, so interior volume is a priority, and it misses the NHTSA classification for a mid-size car by only a fraction of a cubic foot. The front seats of the C-Max are nicely bolstered and comfortable, and occupants will find plenty of leg room and head room front and rear. The standard upholstery is a pale recycled synthetic cloth, with leather available on the higher trim level. The height of the C-Max also makes it easy to enter and exit, a plus for older or less-mobile passengers. While the rear seat is capacious for two adults, the bottom is low, meaning passengers with longer legs end up sitting with their knees high. The rear seat folds and lowers with a single lever, and the C-Max offers numerous family-friendly features: bins under the feet of rear-seat riders, a storage net, hooks for grocery bags, even a 120-volt outlet in the rear cargo bay. Cargo volume of the hybrid version is 25 cubic feet with the rear seat up, 52 cubic feet if it’s folded down. That’s somewhat less than the space available in the Prius V wagon. The Energi plug-in hybrid’s larger battery pack cuts cargo volumes to 19.2 cubic feet and 42.8 cubic feet respectively, and its multi-level load floor with the seat folded down is challenging to use. Both versions have a cargo floor notably higher than the tailgate opening. Compared to both compact crossover utility vehicles and more fuel-efficient compact cars, the C-Max still offers a firm but composed and refined ride. Lots of sound insulation plus active noise cancellation keeps the mutes engine and road noise and gives it a quiet interior under almost all circumstances. While the 2018 Ford C-Max gets decent crash-test ratings, it offers no advanced safety features at all. The 2018 Ford C-Max earns decent, if not top-level scores, on crash tests, but its electronic safety systems are limited to a standard rearview camera and blind-spot monitors. The IIHS gives the C-Max its top rating of “Good” in all tests except the tough small-offset front crash test, where it gets a second-best “Acceptable” score. The NHTSA gives the C-Max four stars out of five overall. That rating is made up of four stars for roof strength and frontal crash, and five for side-impact protection. A rearview camera was made standard on all C-Max versions last year. Still, the C-Max lacks adaptive cruise control, lane-departure warning, or automatic emergency braking, some combinations of which are now fitted as standard to less expensive and smaller 2018 models from multiple makers. Its one semi-advanced system is an optional parking assist package that will steer the car into parking spaces while the driver accelerates and brakes. The standard features and optional equipment on the 2018 Ford C-Max show that fuel-efficient doesn’t have to mean grim and Spartan. The base C-Max Hybrid SE comes standard with keyless entry, dual-zone automatic climate control, 17-inch alloy wheels, a six-speaker audio system, a rearview camera, a lighted glove box, and heater vents for rear-seat passengers. User-configurable digital displays with fuel-efficient driving tips are standard, as is a 4.0-inch display screen in the center of the dash. The Titanium trim level swaps in different 17-inch alloy wheels, keyless ignition, rain-sensing wipers, ambient LED lighting for the interior, leather upholstery, a 10-way power adjustable front passenger seat with lumbar support, and a reversing proximity warning system. The Sync 3 voice-control and infotainment system with an 8.0-inch touchscreen display is optional on the SE, standard on the Titanium version. It’s vastly better than the dismal MyFord Touch system on earlier model years, but the hardware can still lag and we noticed its day and night display modes switching back and forth quite a lot, which is distracting. A variety of options can be ordered on an individual basis or in packages that group popular features. The standalone items include Ford’s famous foot-operated hands-free power tailgate, heated side mirrors with turn indicators, Sync 3, navigation, and a Parking Technology package that will steer the car into a space while the driver accelerates and brakes. A Winter package adds puddle lamps and heated power mirrors, while the rear-park assist system is bundled with the power-operated liftgate. Another bundle groups Sync 3, Sirius XM satellite radio, and Sync Services that include real-time data and other upgrades. The 2018 Ford C-Max is likely to return 37 to 40 mpg in mixed use, and the Energi version is rated at 20 miles of electric range; numerous competitors do better. The C-Max is still one of the most energy-efficient cars Ford sells, but it’s no longer close to the Prius, which now comes in at 52 or 56 mpg combined. Similarly, the C-Max Energi is rated at 39 mpg combined and 20 miles of electric range, versus 54 mpg combined and 25 miles for the Prius Prime. Sales of all hybrids are suffering, of course, in this era of cheap gasoline. So-called Eco Coach displays are standard, offering help and tips to drivers who want to maximize their fuel economy and take advantage of the car’s electric power and regenerative braking. Meanwhile, Ford has switched to marketing the C-Max as a fun and practical small family vehicle rather than stressing its fuel-economy credentials. Sales have steadily fallen over the last few years, however. My 2013 Ford C-Max Energy by far is the most reliable and safest car I have ever owned. Ford ,I wish you would reconsider starting production up for the CMax Energy again. This car is a tank . IT can take a 50 mph rear end collision with little damage to the back end of the car due to the... Ford ,I wish you would reconsider starting production up for the CMax Energy again. This car is a tank . IT can take a 50 mph rear end collision with little damage to the back end of the car due to the reinforced Chasis for the battery. 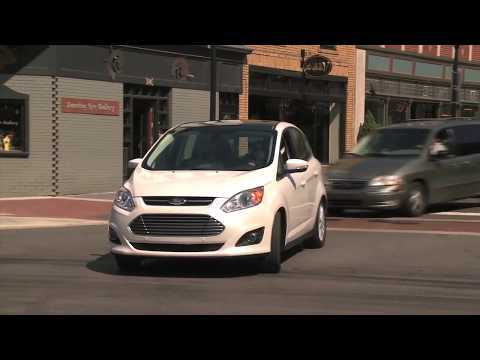 See YouTube 2013-2018 Ford C-Max energy rear end collision tests. It is unbelievable on Gas mileage . It has plenty of room . The technology on board is like no other. I have 2 Toyota’s that cost much more in price and I consider them junk compared to my CMax Energy .my wife and I were hoping to buy another one or two this year. Best car ever made . Good Job Ford and thank you so much . The best value for the dollar that I have ever spent money on.